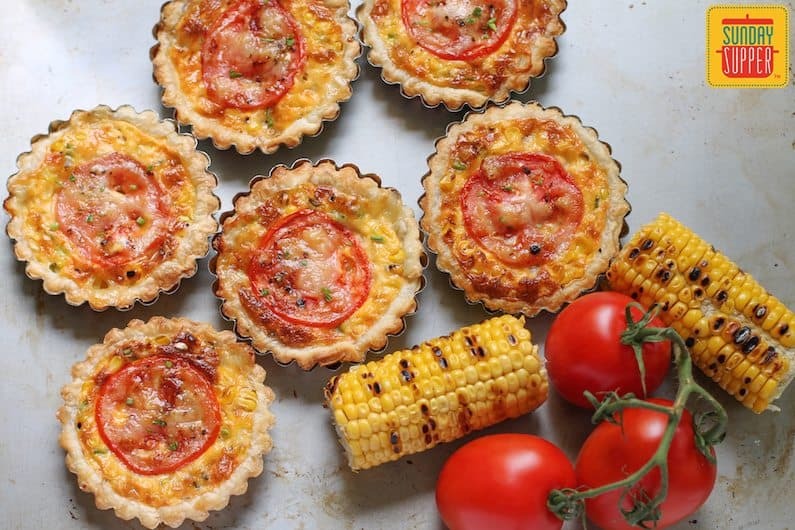 Cheesy corn tomato tartlets boast grilled fresh corn, melty cheese and a pretty slice of tomato on top, all baked in flakey puff pastry. Growing up mostly in the United States, I was spoiled with ample sweet corn every summer. When the first ears would start appearing at farm stands and grocery stores, we would eat it often. Boiled briefly, embuttered, with a sprinkling of salt. It was the best part of every meal, second only to my grandmother’s spicy Cajun maque choux best made with fresh sweet corn. I didn’t realize until I moved overseas that not every country feels the same way about corn on the cob as we do. In France and Brazil in particular, corn on the cob is cow feed. The varieties they grew, at least when I lived there, were not sweet or juicy. An Australian friend once told me the story of serving up sweet corn on the cob to her French in-laws. They stared at their plates in horror, not even knowing where to start. At first she couldn’t figure out what was wrong. Eventually she cut the niblets off the cob for them, but still they picked at the corn, just to be polite. Mais, non, people don’t eat cow feed! My friend and I had a good laugh over the foibles of people and our tendency to stick to old habits. We both agreed that there is nothing better than good sweet corn, eaten right off the cob. Here in Dubai we are fortunate enough to get Australian sweet corn on the cob. 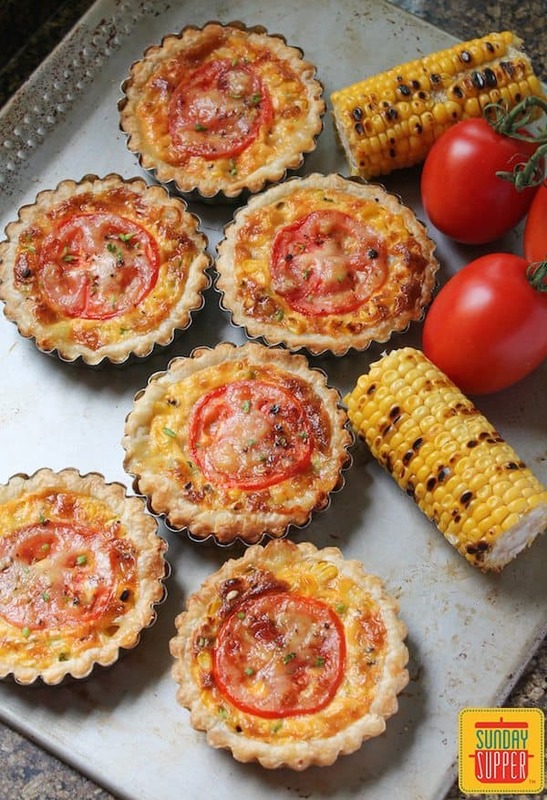 It’s fabulous just on its own but if you want to get fancy, grill it on a grill pan or over a charcoal fire to add a smoky flavor, then cut the niblets off and use it in cheesy corn tomato tartlets. We ate these little beauties as a main course, alongside salad and green beans, but they would also be perfect on your brunch buffet table or as appetizers at the start of your Sunday Supper. I can also attest that they are great in a packed lunch to eat at school or at the office. Set aside to cool. When cool enough to handle, cut the niblets off of the cobs. Slice your tomato into six circles and lay them out on paper towels to get rid of excess juice. Mince your green onions and set aside a small pile for garnish. Cut the rind off of your cheese, if it has one. Then cut the cheese into small pieces. Set aside a small pile for adding to the tartlets just before baking. Preheat your oven to 375°F or 190°C. Prepare your tartlet pans by cutting out little circles of baking parchment and placing them in the bottom of the pans. Unroll your puff pastry sheet and cut it into six pieces. Fit the puff pastry into each pan. Press down on the pastry all around the edges and remove the excess. In a medium mixing bowl, whisk your eggs together with the cream, salt, corn, green onions and cheese. Give the bowl a few good grinds of fresh black pepper. Use a measuring cup to distribute the filling relatively evenly in the six tartlets. Top with a slice of tomato each, then sprinkle on the reserved cheese. Grind on a little more fresh black pepper. Put the tartlets on a cookie sheet and pop it in your preheated oven. Bake for about 20-25 minutes or until pastry and filling are both golden. 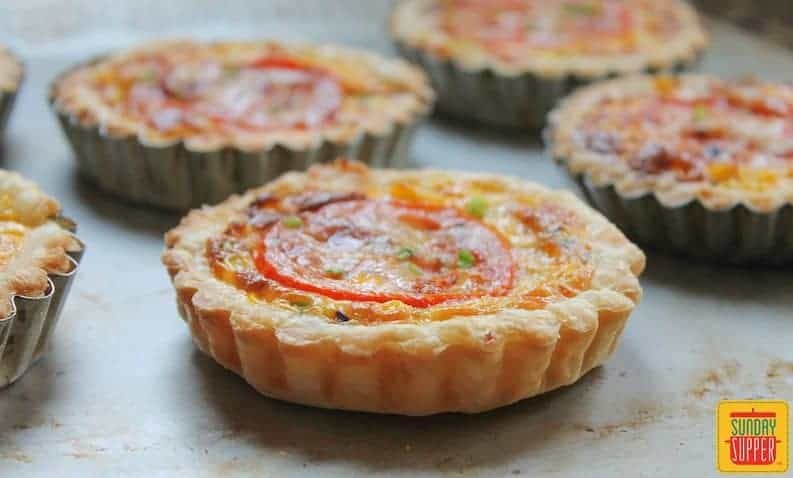 Run the point of a knife or wooden skewer around the edges of the tartlets to loosen the crust. Carefully turn the tartlets out of the pans. Sprinkle on the reserved green onions for garnish and serve warm or at room temperature. Are you a fan of sweet summer corn? This may be your favorite Sunday Supper yet! I know it’s one of mine. Check out all the corny wonderfulness we are bringing to the virtual table today. Many thanks to our host, Ellen of Family Around the Table, and our event manager, Renee from Renee’s Kitchen Adventures. 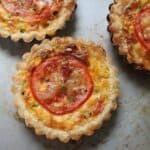 Pin Cheesy Corn Tomato Tartlets! These are so pretty too! What a great idea for brunch! What a funny story! Corn on the cob is definitely the best part of summer – culinar-ily speaking anyway. These tartlets are simply beautiful. Corn + tomato is a perfect pairing. These are perfect for a party!